Stunned, the 34-year-old Humphrey quietly gathered his kids and left. “I wasn’t gonna do anything confrontational in front of the kids,” he remembers. “But I was really upset. I wasn’t sure what to do or what to say, so I just decided to leave.” He still isn’t quite sure why he was asked to leave. Perhaps the women thought he was a “creeper,” he says. But that doesn’t make much sense considering he was at the park playing with his own children. “And what was really frustrating was that their kids were playing with my kids,” he adds. Humphrey’s story is extreme, but the scene he describes is an all-too-common one for stay-at-home dads such as himself. They report being shunned by the groups of moms that congregate and socialize at the park and playground each day during the workweek, despite showing up there every day. These kinds of stories are especially common online, where stay-at-home dads vent in Facebook groups about frequently getting the cold shoulder from stay-at-home moms — women who are ostensibly part of their same cohort. 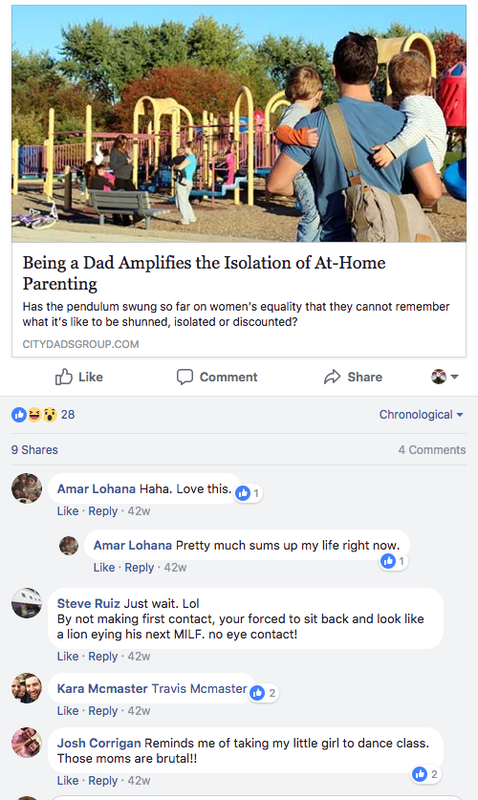 “Being ostracized by stay-at-home moms in parks, malls and other areas where parents go with their children is one of the topics fathers frequently discuss in online spaces,” says Tawfiq Ammari, a PhD candidate at the University of Michigan, where he studies how fathers express themselves on social media. He cites one example where a father recalled a mother trying to break up a fight between his children because she assumed he couldn’t manage the situation. Enduring gender stereotypes are hard to ignore. Humphrey speculates he was asked to leave the park because he lives in Charlotte, where social progress tends to lag behind the rest of the country, and where stay-at-home dads are especially unfamiliar. “Living in the Bible Belt, one of the biggest stereotypes is that the woman is supposed to stay home and raise the kids, and the man is supposed to the breadwinner,” Humphrey says. As such, he can often sense the moms gossipping about him. “You just get that feeling that you know people are talking about you. At first when that happened, I’d almost always leave.” Since then, though, Humphrey has stood up to the moms, and while he’s not friends with them, they at least now tolerate his presence. These men are usually “evening dads,” Sliozis’ term for dads who only parent after the workday is done. When moms do see a father on the playground during the day, they often falsely believe it’s the rare “daddy’s day out” with the kids± — and not a full-time stay-at-home dad. “Why is a mom going to make friends with a dad who she thinks she’s going to see only once in her life?” asks Michael Jenks, a 39-year-old stay-at-home father in Anchorage, Alaska. Other times, the moms are wary that the men at the park will try to hit on them. At least, that’s what the dads assume the moms are thinking. “There’s still a stigma to a man trying to initiate a conversation with a woman in any format,” according to Sliozis. It must be Dads day at the playground. Hardly any moms here. Stay-at-home moms develop baby-sitting co-ops, attend baby showers, and develop playground networks. Stay-at-home dads miss out on all this! Whatever the case, the dads have turned to each other for company. Lance Somerfeld, a 44-year-old stay-at-home dad on the Upper East Side, for example, started handing out business cards on the street advertising a dads meetup. “The menu of options for new moms is huge. There’s baby lamaze, baby massage, mom and me yoga. It was important for me to create this experience for dads because we were already behind the eight ball.” And so, he gathered his nearby dads for baseball games, museums, and of course, the park. In 2013, Somerfeld formalized the organization as the City Dads Group, and it’s since grown to include chapters in 34 cities across the country. 1. Minds his biz, watches his kids guy. 2. Kinda chatty, a little lonely, still watches his kids guy. 3. Super engaged, likes to share parenting and dad tips guy. 4. Scouting for moms and nannies guy. 5. Vicariously living through his kids guy.